We can set you up with one of our Assistive Technology Professionals for an appointment to experience the i-Level power wheelchair. With features like standard 6 mph motors and advanced responsiveness,the Q6 Edge® 2.0 is engineered to meet the performance needs of the most active user. 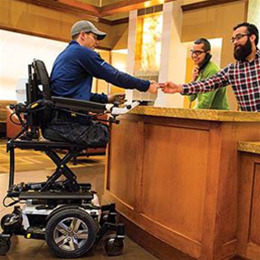 The Q6 Edge® 2.0 accepts a complete range of seating and electronics options to deliver exceptional rehab capability at an excellent value, and is available with our iLevel® technology. 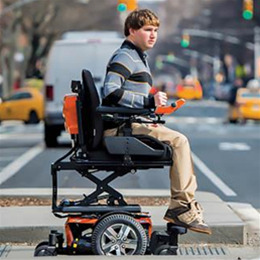 iLevel® Power Chairs offer safe eye level operation at the speed of life. 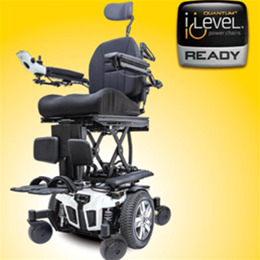 iLevel's advanced functionality and stability strengthens independence and quality of life. 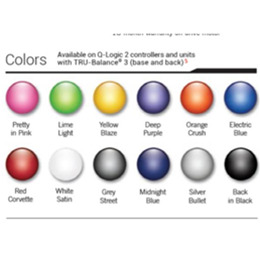 iLevel improves access to one's environment and enhances social interaction by allowing operation of the power chair with the seat elevated (up to 10 inches) in 16 seconds while at walking speed (up to 3.5 mph). Overall Base Size- Width: 24.4"